During the first few days of WWII, the Soviet army lost a large number of various cars and trucks. Although most all cars and trucks in the Soviet Union were taken over by the Red Army, it was still not enough to replace the lost ones. The most needed was a medium light-weight truck of simple and reliable construction. Engineers of the ZIS factory in Moscow tried to find a solution in re-engineering of the existing ZIS-5 truck. The goal was to spend minimum production time and resources in producing a reliable truck. Research resulted in a truck based on the chassis of the original ZIS-5, but with a wooden cab. The base and sides of the cargo space were also made of wood. Engineering effort to save material resulted also in reducing the number of headlights to only one. The converted truck was now known as the ZIS-5V. Production started at the Moscow factory in 1942. The ZIS-5V was also later produced at Myass too. A large number of different variants were based on the original ZIS-5V. Other variants were a mobile repair station, a fuel truck (subject of this kit), a half-tracked truck ZIS-42, an ambulance ZIS-44 and an anti-aircraft gun carrier etc. The kit came in a tray and lid type box. I cannot remember any more if it was ever shrink-wrapped. 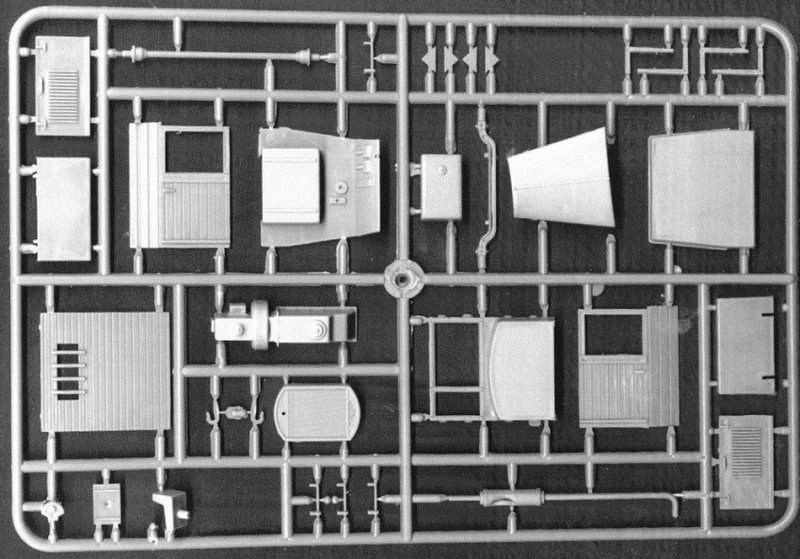 Fort is a model company based in the Ukraine. 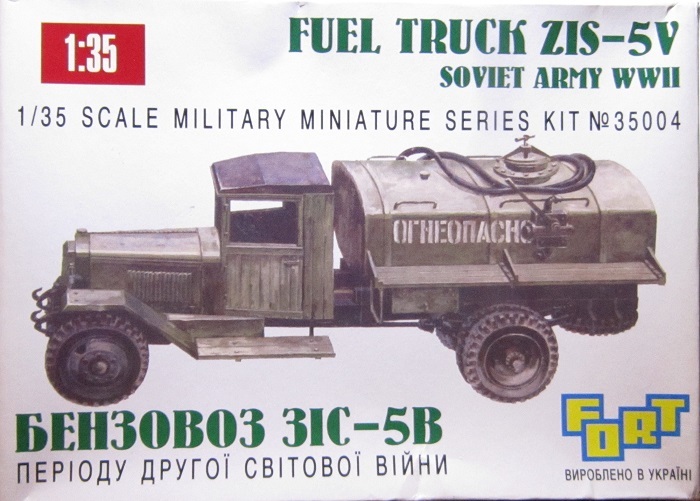 The box art shows a ZIS-5V fuel truck in overall dark green with a white Russian word stenciled on the side of the fuel tank. This side profile is against an all white background. This is strongly similar to the way Tamiya does their box arts. One side panel shows full color box arts of three other kits that Fort sells that are variants of this truck. 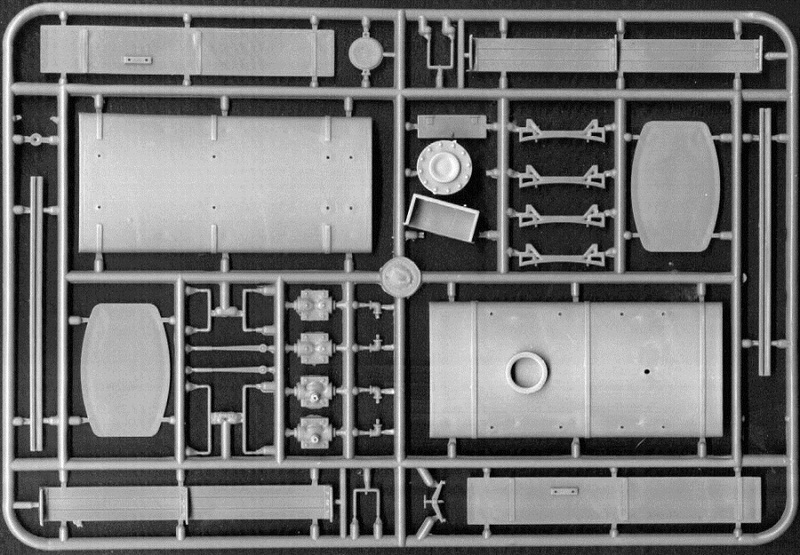 One is a flatbed truck – Kit no. 35001, one is an ambulance with a wood box structure with windows on the rear – Kit no. 35002, the last one is very similar to the first one and shows the rear cargo covered with a canvas roof, as the only difference I can see and it is Kit no. 35003. The other side panel shows Fort's P.O. address and FAX number. Inside the box are 3 trees of dark gray parts in a sealed cello bag, a tree of clear parts in a cello, black plastic tires in a cello, the decal sheet and the instructions. The instructions consist of a single sheet that is folded in the center into 4 pages of 8 1/8” x 11 ½” format. Page one of the instructions begins with a repeat of the box art in black and white, followed by the history of the ZIS-5V in English and Russian. The bottom of the page has some general instructions and precautions, in the same 2 languages and the parts tree drawings. Page two through the top of page 4 give a total of 7 assembly steps. The bottom of page 4 has three 2-view drawings for marking and painting the model. The first one is in overall khaki with a military brown undercarriage for a vehicle in Germany in 1945. No unit name is provided. The second one is in the same base colors as the first one, but with a dirty worn whitewash on top of these colors. It is for a vehicle in Poland, December 1944. No unit name again. The third one is in the same base colors as the first two, but overpainted with a wave pattern of sand. It is a vehicle also in Poland, autumn 1944. Again no unit name. 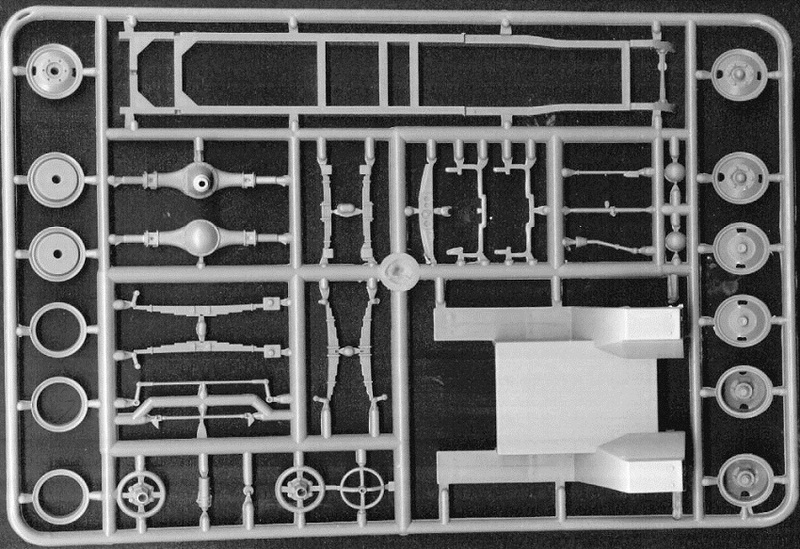 None of the parts trees have part numbers molded on them. You have to keep referring to the parts tree drawings on the instructions to find the part number you want on the trees. Bad move Fort ! 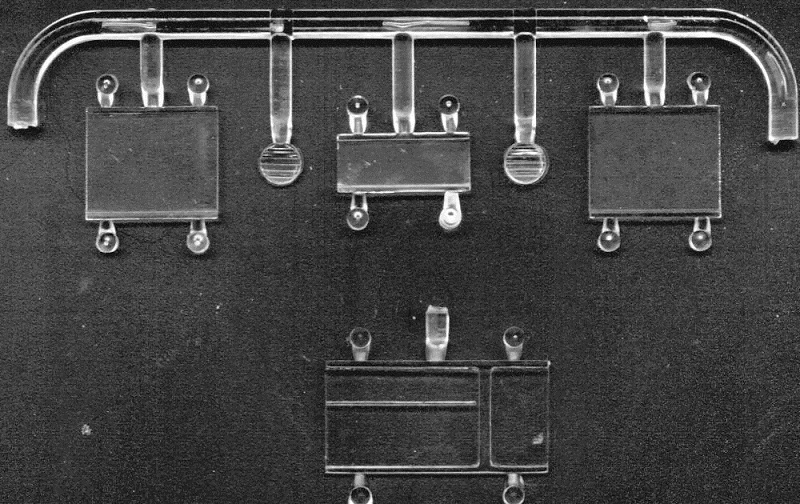 The little clear parts tree holds 3 cabin windows and 2 headlight lenses. I find this kind of odd, because the history of the kit said that the headlights had been reduced to only one. There is a single window pane in the cello bag with the other clear parts. This one is not shown on the parts tree drawing. A look through the assembly steps showed that this is the windshield part with a sliding panel in it. The final items in the kit are the black plastic tires and the decal sheet. 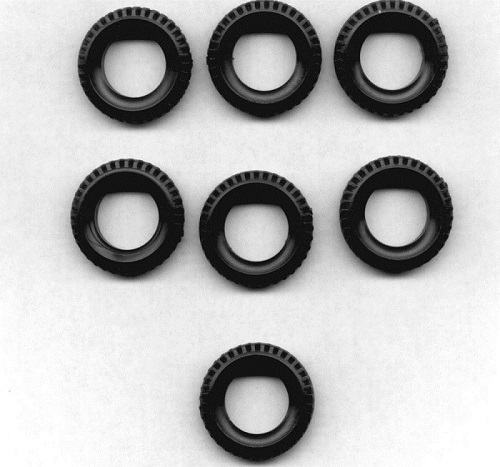 You get 7 of these tires. Four are mounted on the rear, two are mounted in front and the 7th tire is a spare that gets stowed below the rear of the vehicle. These are all in a sealed cello bag. The decal sheet holds a lot of all white numbers and Russian words. Some are probably tactical markings or license plate numbers, along with the big Russian word that goes down the side of the fuel carrying tank. Unfortunately, my scanner will not show white lettering on a decal clearly, so forgive me for no image of the decal in this review. There are no figures in the kit and no engine. Only the oil pan is provided. This is one neat Soviet WWII truck. To me, it looks like a Ford Model T. Highly recommended. I think it will be a simple build. Kit was courtesy of my wallet when I bought it from an Australian hobby shop that since has gone out of business.